The photo shows a 2-4-0T carrying the number plate 3839. There is no information on the back of the print. My thought is the loco looks typical of the LNWR and the format of the number plate supports this idea. I also think the background scenery is typical of the LNWR’s Cromford & High Peak line. A feature that is new to me is the triangle shape seen below the buffer beam. The apex of the triangle, which is at the bottom in this instance, is located where an incline winding rope would be. However, I’m unsure what function the triangle would carry out, so it may be for a different purpose. I’ll be pleased if anyone can identify the loco type, the loco’s history or the photo location. This picture appears in the LNWRS Zenfolio resource “Goods Loco Group”, “2-4-0T Trevithick Goods Tank” file, photo No 9, and is identified as Duplicate Number 1839 (The LNWR Duplicate Numbers list never reached the 38xx series, so the difficulty of reading nmuberpates at this angle must have caused difficulty). The Locomotive was built as a tender locomotive, No 287 “Eglinton” in 7/1852, rebuilt to a tank engine in 12/1866, to Duplicate List 1839 in 5/1883, renumbered Duplicate List 3061 in 2/1887, scrapped 8/1894. The photo can therefore be dated as having been taken between 5/83 and 2/87. The Zenfolio picture identifies the site as being on the CHPR as you surmise. The triangular fitting seen beneath the smokebox was almost certainly an ash hopper. Thes were fitted to many engines during the Webb period, and had a counterweighted plate at the bottom intended to empty the hopper when it became full. It is said that owing to the constant air leaks into the smokebox caused by this device, many engines so fitted had a bundle of rags or some such stuffed into the hopper bottom to render the equipment ineffective. The location, as Greg suggests, is on the Cromford & High Peak line, and is at Middleton Top. But the numberplate must have been misread (and no wonder!) - it can“t be 3839 because the Duplicate List did not reach so far. So it is probably one of the 30xx series, and Nos 3049 and 3061 of this type are known to have worked on the C&HP around 1890. The photo looks as if it was taken about then. The triangular feature below the bufferplank is the ”char-hopper“ - a funnel to allow char from the smokebox to be dumped automatically. There was a 6“ x 2“ aperture at its bottom end, with a counterweighted flap, intended to open by the weight of the char which had collected above it. W. A. Tuplin has some interesting things to say about the probable uselessness of this arrangement in his ‘North Western Steam’ (Allen & Unwin, 1963) on pp 56/7. Many thanks, Jim, that settles it! 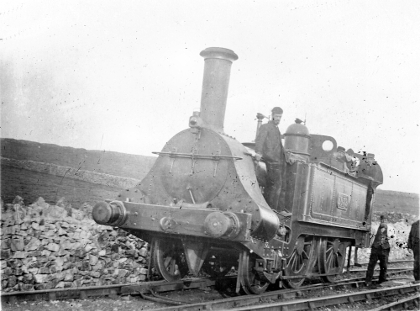 There are other photos of the same engine in John Marshall’s ‘The Cromford & High Peak Railway’ (pub. Martin Bairstow, 1996): as No 1839 on p40, and as No 3061 on p42. Both were taken at the same place, Middleton Top. I think this is Preston, the reason being that the roofing in the background appears to curve away to the right. This would fit in with it being the East Lancs side of Preston which did curve away quite dramatically as is confirmed on plans we have at the study centre. The plans Mr Patrick has at the ‘Study Centre’ aren’t much use if they suggest that this obviously Cromford & High Peak photo was taken at Preston. But maybe he meant his comment to go under another number — 240 perhaps? If so, may I suggest that he ignores these ‘Study Centre’ plans and, instead, looks at some photographs of Leeds New.